So imagine what happens when you combine them? Yup. Fun and excitement. I’d definitely use less oil. Two tablespoons in one serving is huge. I’d start with half a tablespoon and see if you really need or want more. You’ll have the fat from the avocado. Also, I love the idea of a mason jar, but I also know I’m a klutz and would probably break it. So I’d use a plastic container that could double as the bowl. It would need to have a solid and well-sealing lid for when I shake it up. I would also want more beans and no rice to be low-carb. And I’d add in diced tomatoes. I have a confession. I’m not that into black beans. I much prefer pinquito, eye of the goat, and mayacoba beans. You can learn everything you need to know about heirloom beans at Rancho Gordo. Let me just say that it’s true. Fresher beans taste better than old beans. And heirloom varieties have wonderful flavor. I used snowcap beans in place of potatoes in chicken and beef stew. More protein and fiber and less carbs means a happier body. 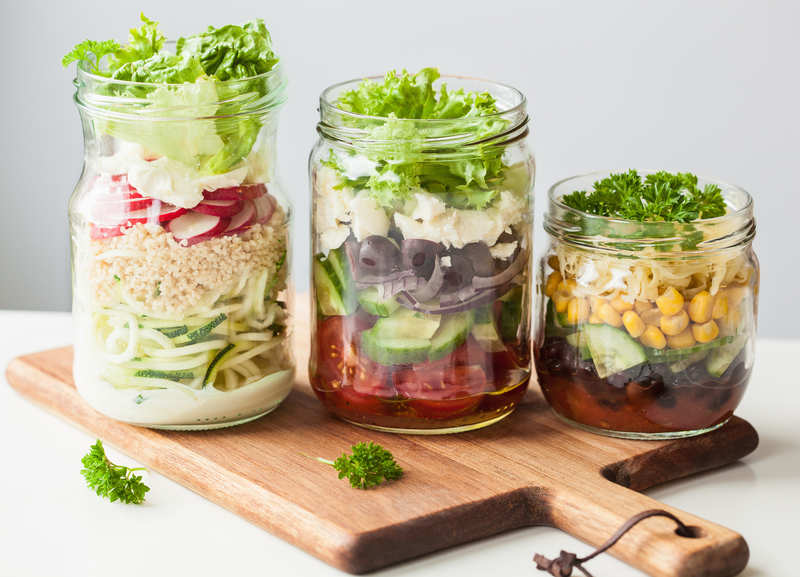 The glass jar is great for salads. The key for success is to put the dressing ingredients on the bottom. Then layer up the vegetables you wouldn’t mind marinating like carrots, peppers, and celery. The next level is the lettuce and cabbage. The top is the items you’d want to keep dry like avocado and cheese. Mason jars are also wonderful for soups. You can microwave the jar and then pour it into a bowl. You can use the same broth and meat but change up the noodles and vegetables. Maybe one day you have chicken soup with alphabet noodles. The next day you have chicken ramen soup. Get inspired with these recipes at Self Magazine.